Jenny Tonge delivers a clear message on Israel’s apartheid state. 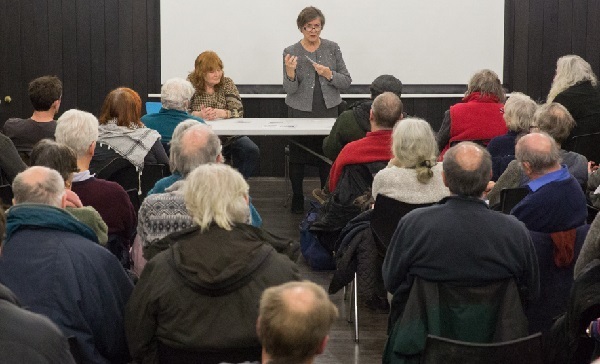 Despite an extensive campaign of intimidation, abuse and vitriol by the pro Israel lobby, Hastings Palestine Solidarity Campaign succeeded in holding its planned talk by Jenny Tonge on Israel’s apartheid state – a victory, as HPSC says, for freedom of speech. The group’s Laurie Holden reports on the meeting, and describes the strenuous efforts which preceded it to overcome the attempts to disrupt it by the faceless defenders of an unacceptable Israel. Photos by Russell Jacobs. In the event it was a full house at Stade Hall, with a good 60 in the audience, as Hastings folk turned out in numbers to show their repudiation of the hate-filled campaign of the anonymous Israel lobby. The speaker, Dr Jenny Tonge, a ceaseless campaigner for Palestinian rights, was in fine form. In a talk entitled Everyday Life in Apartheid Israel she described the daily humiliations which characterise the treatment of Palestinians in Israel, the West Bank and Gaza, as well as their unequal access to health, education, jobs, security and basic necessities such as food, water and electricity. She made particular mention of the Gaza Strip, which is currently in its 11th year under siege, and the devastating number of young amputees she saw there. “One of the things constantly happening is the Israelis, when they are able to fire at protestors, regardless of whether they are guilty of anything, if it’s a young man they go for their legs. Always,” she said. Her message to the audience was clear: “The only effective weapon we have got is boycott. BDS, BDS, BDS. It brought the South African regime down. And the reason they are getting so nasty, and protesting against us all the time, is because BDS is getting through.” BDS of course is boycott, divestment and sanctions. A full account of Jenny’s talk can be found in the press release we issued. What made the meeting even more of a success was that we were able to have the author and musician Tom Suárez, who has played an important part in the Palestine solidarity movement through his books and articles, join Jenny for a lively Q&A. His most recent publication is State of Terror: How Terrorism Created Modern Israel. 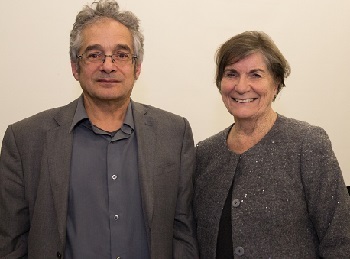 Tom Suárez and Jenny Tonge. This book is the culmination of several years’ research based primarily on British government source documents held by the National Archives at Kew. It showed the sheer violence that the settler zionists used against Palestinian civilians, the British, and even fellow Jews in their efforts to drive out the native population. The various zionist groups were whipped up into a frenzy by its publication, so much so that of the 11 meetings we know that have been attacked by the Israel lobby recently, five were meetings with Tom. With two prominent advocates for Palestinian justice at the same meeting that the Israel lobby tried its hardest to stop, this was surely a double victory. We collected £257.02 for MAP (Medical Aid for Palestinians) and ICAHD (Israeli Committee Against House Demolitions). A big thank you to everyone who left donations, and to Tom Suárez for giving copies of his book Palestine Sixty Years Later to sell. We’ll top it up from our funds to make £300. Ultimately, we need to thank the people of Hastings for refusing to be intimidated and for turning up in such numbers to make the event a great success. “Friends… Let’s get the venue to cancel this event!! !” This was posted on one of the ‘Friends of Israel’ Facebook pages, conveniently adding the phone number and email address of the White Rock Hotel. The campaign to stop Jenny’s talk had begun. The hotel was flooded with angry and abusive calls from Christmas Day onwards, backed up by an online hate campaign that threatened the hotel’s star rating on Facebook and TripAdvisor. Most of the posts giving negative Facebook reviews were from abroad: Tel Aviv, South Africa, Haifa, New York…. They even set up an online petition calling for the cancellation of the meeting. The campaign was designed to hurt the business. A packed Stade Hall shows its appreciation of Jenny Tonge’s talk. But we were determined not to let them win. We found a venue with no internet presence, the Central Hall, which is managed by the Hastings Association of Retired People (HARP). We waited until four days before the meeting to publicise the new venue. But the secretary of the group received a phone call to her ex-directory phone number, which understandably unnerved her. Then we were told about an unpleasant phone call that one of the helpers had received. The people at HARP were getting really worried. They were concerned that there could be trouble at the meeting and said they didn’t want to go ahead. So with two days to go we had to find a third venue. This was Stade Hall, where we initially made a provisional booking – official confirmation arrived only just over four hours before the meeting was due to start! We had sent a notification to our members and supporters, and we went through the Facebook event list undertaking some careful vetting. One of our members was stationed at Central Hall re-directing people who hadn’t found out. The folk at Hastings Online Times were very patient, making several last-minute alterations to the article publicising the meeting. We didn’t know whether the event would go ahead or not until the last minute. Would the zionists nobble the venue management? Would they turn up to disrupt? Well, you can see by the photos that the meeting was a success. It was a full house at Stade Hall. On Tuesday 5 February Hastings Against War is hosting a talk on Building for Peace in Palestine. It will be an account by local PSC member Gill Knight about her recent tour to Palestine organised by ICAHD (Israeli Committee Against House Demolitions) and Torat Tzedek, two Israel-based organisations which support the Palestinian people. The meeting, at the Quaker Meeting House, 5 South Terrace, Hastings TN34 1SA, starts at 7.00pm. See HOT article. Hastings PSC website and Facebook page.